Our most popular package for small business. This package offers our clients versatility with customized scripting, unlimited photos and videos, and unlimited content. These database driven websites also offer ease of use through their speed, updateability, and back end security. But the main reason this package is so popular is its price. 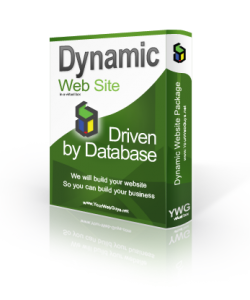 Any of the Dynamic Package Scripts listed below can be used to create your Dynamic website, however most of our clients choose to use the content management system. As a matter of fact, it is so popular that we have designated it our standard platform to work from. The script you choose will be the foundation of your website which Your-Web-Guys will build upon and customize to meet your specific needs. Click on any of the below to find out more about that specific script and examples of its use.